Lehigh Valley won behind Mark Leiter’s six shutout innings. Reading lost although Carlos Tocci is approaching .300 with 3 hits including a triple. Clearwater and the FSL are on their All Star Break. Lakewood won their 40th game, but fell short of the first half division title. Lehigh Valley (45-24) beat Syracuse, 4-3. Mark Leiter (1-0, 4.74) won his first game with 6.0 innings of 2-hit ball. He walked none and struck out six. Colton Murray (3.94) gave up 2 runs on 4 hits in 1.0 inning. Pat Venditte (2.35) gave up 1 run on 3 hits in 1.0 inning, striking out three. Jesen Therrien (3.48) earned his first save with a scoreless inning. The IronPigs struck in the first on Dylan Cozens’ 2-run HR (16). They added a run on Jorge Flores’ RBI single in the fourth. And, tacked on a run in the fifth on Pedro Florimon’s solo HR (4). Cameron Perkins, Nick Williams, and Flores had 2-hit games. Jorge Alfaro drew his third walk (of 7 this season) in his last 3 games (12 PA). Has he lost his aggressiveness? Reading (38-27) lost to Binghamton, 6-2. Mario Sanchez (4-2, 2.87) gave up 4 runs (3 ER) on 6 hits and 3 walks. Joe DeNato (1.18) pitched a scoreless inning. Austin Davis (1.77) gave up 2 runs in the eigth inning but struck out three. The Phils scored single runs in the fifth and ninth innings on an RBI single by Zack Coppola (.227) and and RBI single by Harold Martinez (.242). Carlos Tocci had 3 hits. Nick Rickles had two. Sanchez and DeNato each picked a runner off first base. With 3 games remaining, the Threshers need only win out to clinch the first half title. They hold the head-to-head tie breaker over Tampa with whom they currently share the same record, and Daytona with 4 games remaining can’t claim the title unless both teams ahead of them lose a game while they win out. Lakewood (40-30) beat Hickory, 4-1. The BlueClaws finished the first half with a 6-game winning streak. But, fell 3 percentage points behind Kannapolis in the division race. Ranger Suarez (1.92) allowed just one run on 7 hits and 2 walks in 5.2 innings. Trevor Bettencourt (3-1, 3.33) got the win with 3.0 innings of one-hit ball. Both teams scored in the first inning, Lakewood on Darick Hall’s RBI double. The game remain tied until the bottom of the eighth when the Blue Claws scored 3 runs on Hall’s 2-run double and Henri Lartigue’s RBI single. Mickey Moniak’s successful no-out, sacrifice bunt moved Hall’s RBIs into scoring position. Arquimedes Gamboa stole his first 2 bases of the season. 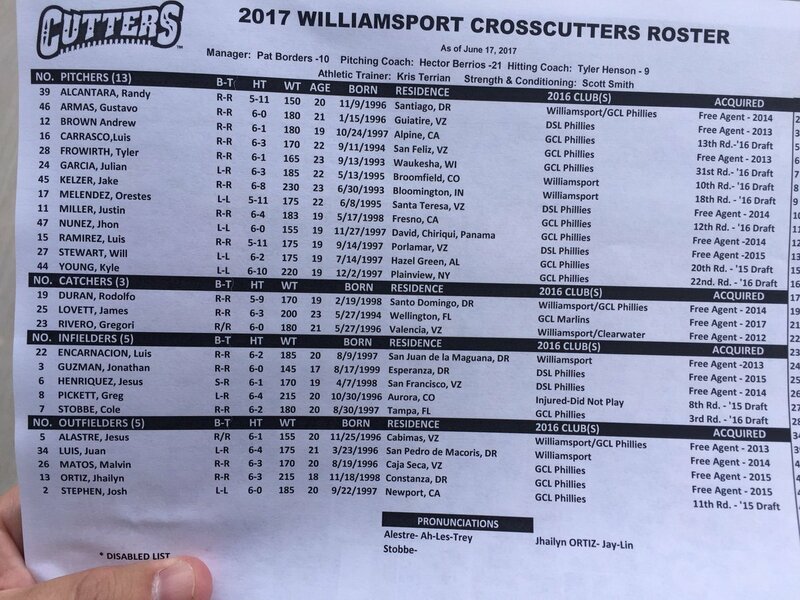 The Crosscutters released their Opening Day schedule. 6/18 – C Greg Brodzinski assigned to Reading Fightin Phils from Phillies Ext. Spring Training. Hoskins has really took a turn in the opposite direction which is exactly why you don’t call up a player or get overly excited over a hot month. I agree with your comment to a certain extent. Although he is really struggling lately, Hoskins is a guy who has hit all the way up through the minors. It’s not like he has had one hot month in four years. Hoskins, Williams and Cozens are 2, 4 and 6 in total bases in International league. Did some digging to try and confirm Sixto velocity Saturday night..
Crawdads starter was 2016 6th rd pick Kyle Cody from UK (2012 Phils 33rd rd pick, didn’t sign)..
His FB is said to be 93-96 T98. I watched the gun pretty closely, and he was sitting 95-96, did top at 98.. So seems like the gun was pretty accurate for him. Regarding Sixto, the first inning he was 98-99 T100.. Worked extremely quickly, almost like he was throwing to an exact gameplan from the pitching coach. Mostly FB through the order the first time. One inning, I want to say the 2nd.. He sat around 94 for whatever reason. The last batter of the 3rd he threw 4 pitches and was 100, 101, 100, 101. In the 4th and 5th he worked off his breaking stuff a little more. Hung one that got hit for a single, but otherwise it looked pretty sharp. Looked like a slider at 81-82. Was disappointing to see him pulled after 56 pitches, but clearly they have a plan they do not want to deviate from. For a shorter guy throwing 100, somehow he looked fluid. His lower half is powerful, and I thought he looked more than the 185 he was listed at. Easy to forget he doesn’t turn 19 for a month. I would be shocked if he’s not right around 50 in the industry rankings after this year (assuming he stays healthy). 9 K/9 doesn’t jump off the page, but 0.8 BB/9 sure does. Cody was very impressive at the game. Consistently hitting 97. Kid looks like a pitcher at 6’7. Lakewood really couldn’t touch him. Lartigue hit a line drive double to right center and Moniak hit a deep ball to the edge of the warning track in dead center field. That was about it. Surprised that Cody was only a 6th round pick. He was throwing like he should be in AA. Cody was a 2nd rd pick in 2015 but didn’t sign then either. Was reported he was offered lower than slot because of a potential medical concern. Went back to UK and had a rough Sr. season, so fell to the 6th. When I saw how well Cody pitched, I also looked him up. He can be impressive but he can also allow 5.5 runs in 2 2/3 IP or 6 ERs in 4 1/3 innings. He’s had a tough time stringing together back-to-back good starts. Being 6’7″ could explain some of his inconsistency. I just hate to see a really inconsistent guy have his best outing against one of our Farm Teams. But it’s also good for our prospects to see really good pitching so they can make adjustments. I remember Pedro Martinez being superman against most teams but always getting smack around by the Yanks. Their adjustment was pretty simple. Make him throw a lot of pitches. That means fouling off his really good pitches. Don’t try and hit an unhittable pitch; just try to get a small piece of it. After he’s thrown 100 pitches in 5 innings, he’ll be done. Attack the bullpen. It can’t be better than Pedro. Although Hoskins may not be getting hits, he is not KO at a high rate. He was on a ridiculous pace early in the year, and now he is regressing to the mean. I did see somewhere, maybe here, that Hoskins average is just reverting back to career norms. Not overly concerned. ………………and he is still producing quality at bats and driving in runs. In fact, he hit #16 tonight, imagine that you! ……….and #17, yep he is washed up, no doubt about it! I see the name Cody and right away I think of Asche, our next Utley………. I still have a lot of hope for Tocci developing more power. If Benintendi can do it, Carlos’ 6’2″ frame could handle it. If Tocci does not develop the power…HR ability…but can get the gap power going then he could be a very effective CFer. From many reports , his defense is MLB already. And you have to admit….he makes contact, his last 800 PAs , Hi-A and AA, he has a 14% K rate, on the other hand, he could stand to raise his BB rate a few ticks more from 6%. And if he can continue to barrel the ball, then he should be able to get his share of doubles. Guys that have no power to speak of will always have a hard time raising their walk rate because pitchers will pitch to them and take their chances making him put the ball in play. I guess if they are going to use him in a trade package…better to do it now while his bat does show some life. I really do not think he will bring back much in return or if his being an added value to a package would make much difference. But to tell you the truth…..who do you feel more comfortable with in the system or even at CBP, a guy like Roman Quinn, three years older, but goes on the shelf after 50 games for half- a year, or a guy like Tocci, as lean and power weak as he is, but still manages to play most of the season. For me I was on record from the Start that they should put Quinn on the 25 man sprinkle him in here and there and wait for a team to come calling on him. what I didn’t see coming was the emergence of Altherr but now that’s here and with a 40 Man decision looming on Tocci this off season now is a good time to flip him rather than lose him for nothing. Not saying Tocci brings you back any big value on paper but good scouting on another teams depth might find you the next diamond in the rough. When you start doing the figuring, Tocci competes for an off-season roster spot this year with the likes of Luis Garcia, Elniery Garcia, Hoby Milner and the regressing Alberto Tirado. It will take big roster moves at the deadline or the uptick from a lot of guys not currently in contention for Tocci to not make the Phils’ 40 man. It’s very unlikely he will develop legitimate power. He’s a skinny little guy and always has been. Benintendi is strong through his forearms (much like Kingery is) and could have been projected to develop power. Tocci may hit 5-7 homers a year, but it’s hard to project much more than that. I cant believe I’m sitting here on June 19, 2017 and I’m actually reading people on this message board STILL writing about Tocci maybe developing power. Yes. Thank you! This same conversation has been going on for like 4 years with people who obviously have never seen him in person. He has the build of a cross-country runner. He is never going to have close to average power. Catch, I’ve seen him. Every season. I’ve reported his lack of weight gain. Every season. I even reported that when he was called up to the Threshers that it looked like they pulled his new jersey off the kids rack in Diamond Outfitters, and it still looked big on him. I have no delusions that he will ever develops power. But, I chuckle to myself every time I see his possible power alluded to in the comments section. OPS is still a measure of power. The combination of, and ability to get on base and hit for power…..and in this case, Tocci’s ‘power’ is legging out doubles and triples….41 in the last 800 PAs of Hi-A and AA. Basically referred to as gap power by some. Now thinking power is strictly HRs….then that will never happen for him, and not sure who is talking about him hitting HRs since it is obvious he does not have that ability or strength. Apparently, his MLB future, if there will be one…is in the mold of the Inciarte, Revere type of hitter. Glad to give you a chuckle, Jim. Alfaro sprinkling in more and more walks. I have to think that some of his recent struggles at the plate are due to a change in approach. I’m sure this is something a coach told him he’d need to be be a successful Philly – even if he doesn’t need it as much at AAA. Great way to look at it. Would be interested to see his swings or lack thereof, now compared to the past. Anyone know what to make of Clearwater’s Jan Hernandez being sent back down to Williamsport, as noted in the list of transactions? It’s just a paper move so they can juggle players. I don’t think it’s a big deal. Yet. Specifically, they had to put Cole Irvin on the roster so that he could pitch in the All Star game. Stobbe and Pinkett homering in first game! Young dominating too! Don’t forget Appel. He put together quite the game!